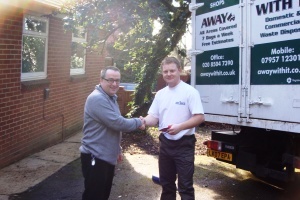 For more than 10 years we’ve been supplying garage clearance Forest Gate homeowners consistently rate highly and are happy to recommend. They really like us for our prompt, versatile service and competitive rates. We reckon you definitely will too! You have decided to turn your garage into a workshop or gym. These are but a selection of the reasons customers in the IG9 vicinity decide to make use of our garage clearance service. But whatever your reasons, we can guarantee you hassle-free and flexible service at an economical price. Of course this isn’t an exhaustive list of things that we can conveniently and securely remove from your garage but if yo have any particularly exotic requirements just give us a call! We are licensed waste carriers. 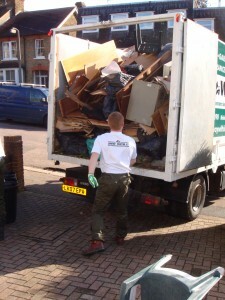 You can trust us to carry out a completely professional job and take care of all your waste properly and lawfully. We are a local firm and we work 7 days a week from 7am to 11.30 pm. Evening and weekend appointments are always readily available. We provide a swift, same day collection services. At any time you need us we are only a phone call away. Booking is in two hour slots and we’ll always call ahead to let you know when to expect us. So you won’t be left wasting time and can get on with your day. Our clear pricing policy means there won’t be any nasty surprises when the job is completed. The price we quote is the price you will pay without hidden supplements. 80 per cent of the junk that we remove will be recycled. To consult a member of our knowledgeable team about your needs for garage clearance Forest Gate just give us a call on 0208 504 7390 or 07957 123019. We’re right here 7 days a week to answer your call and will happily address any concerns and put together a competitive price estimate that’s inclusive of all labour, carrier and transfer fees. Otherwise, forward your information using our online request form and we’ll get back to you quickly.